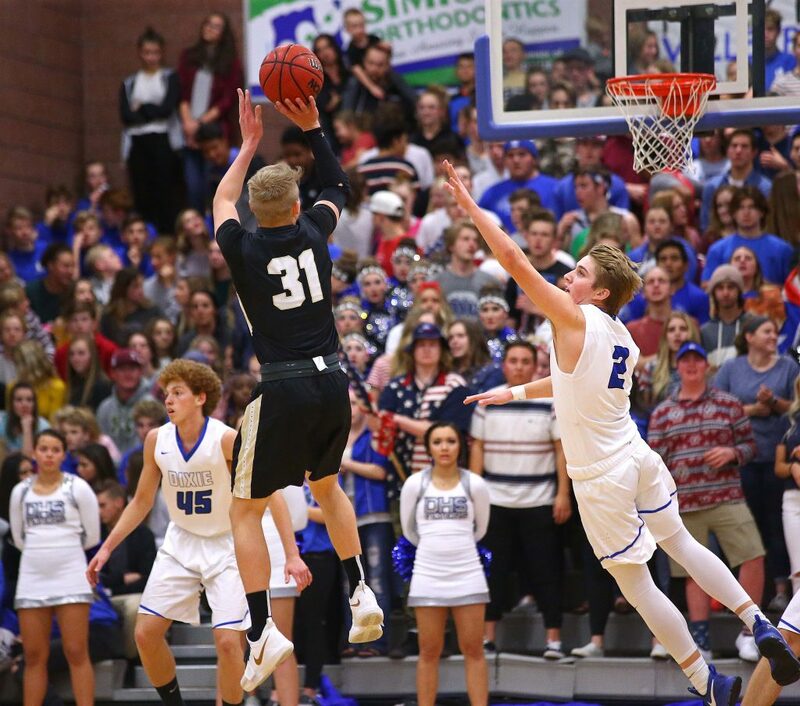 ST. GEORGE – It was fitting Friday night that the game between Region 9’s two unbeaten teams came down to a last-second shot. 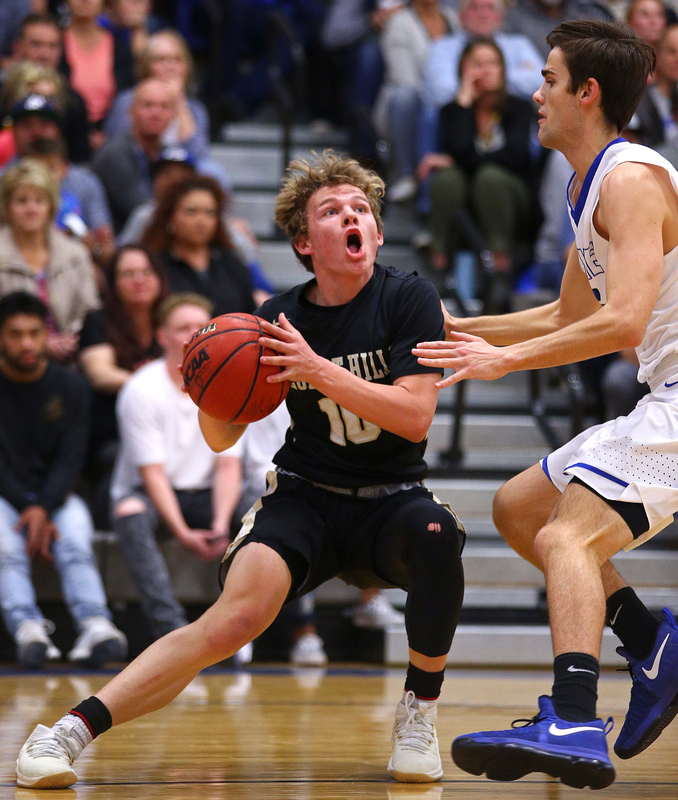 Dixie and Desert Hills have been nearly mirror images of each other this season. It took a last-second putback by Payton Wilgar to make a distinction between the two. 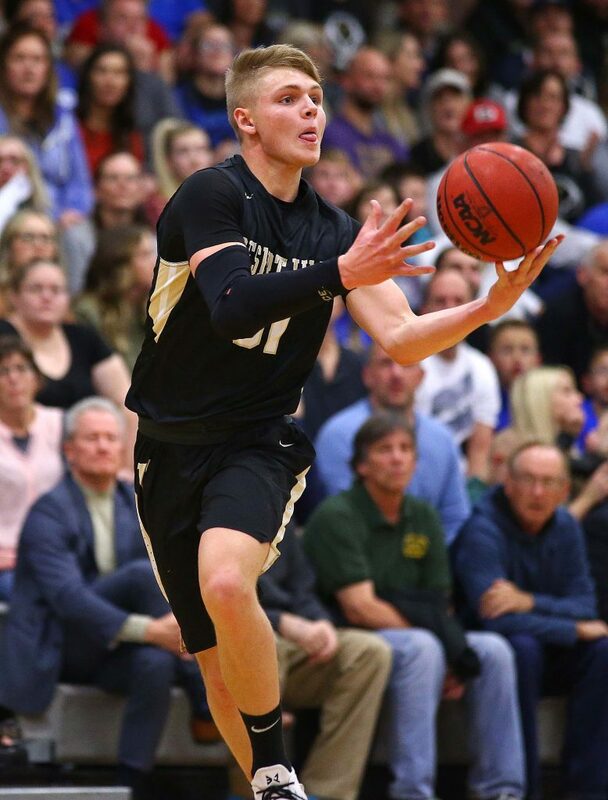 Payton Wilgar is not your 20 points a game kind of guy. 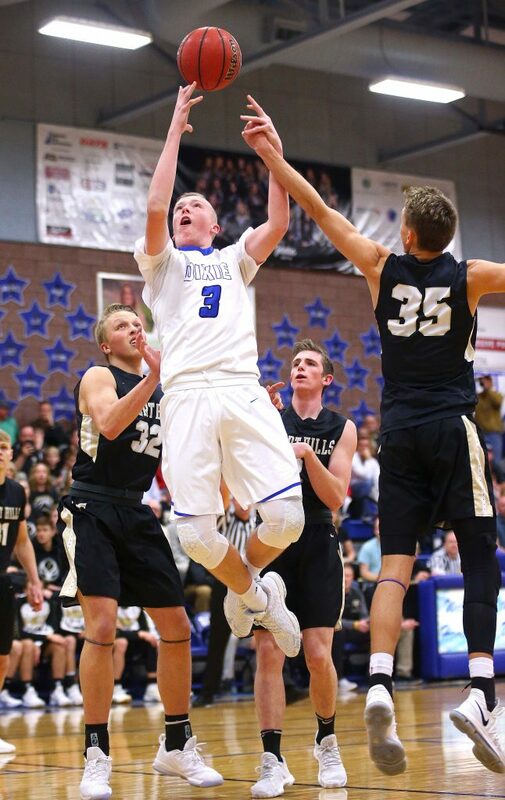 In fact, the Dixie senior, who averages just a shade under six points a game, has made his reputation as a defensive and rebounding specialist. It’s the rebounding part that made the whole end-of-game scenario play out like it did. 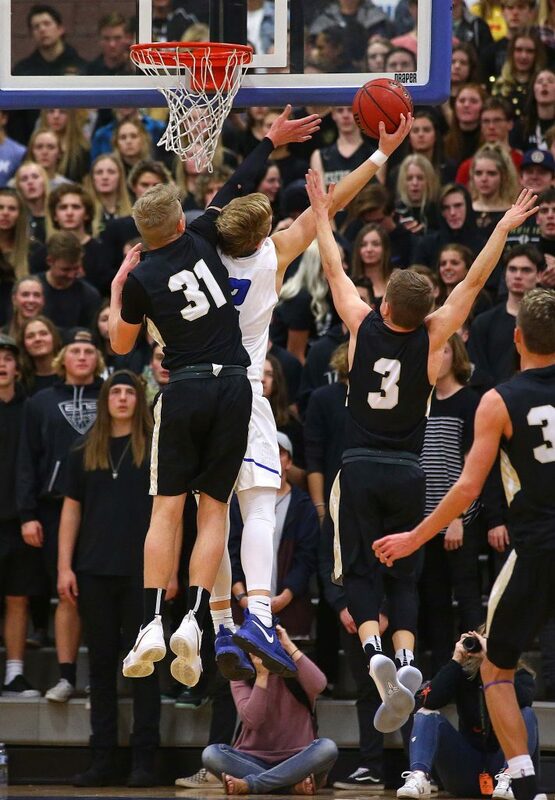 “I noticed Tanner (Cuff) was pulling up with some time left and so I tried to get myself in a position for the rebound,” Wilgar said. Cuff did toss up a running shot in the right side of the lane with under five seconds to go. 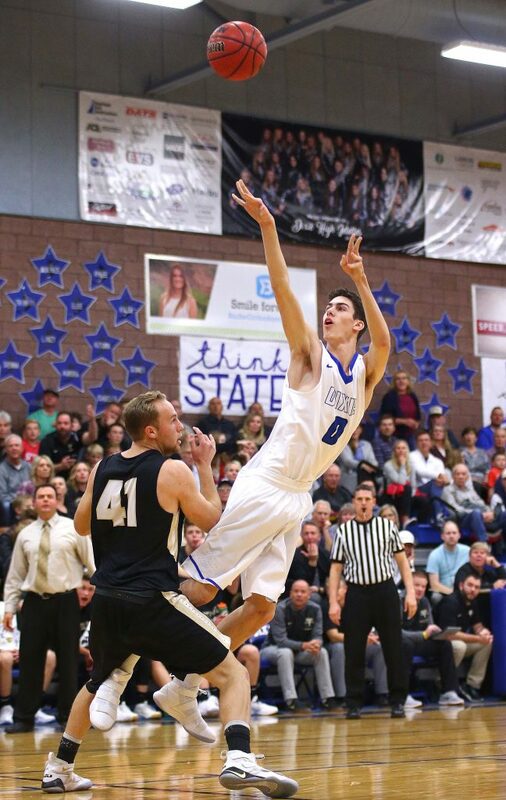 Wilgar, on the left side, saw the shot roll off his direction and snagged the rebound. But his putback try was short. Replays showed the second putback try by Wilgar left his hands with 0.4 seconds on the clock. By the time it rippled the net, the clock read 0:00 and the Flyers had come away with the narrow win. The atmosphere was electric, with not an empty seat in the gym. Both student sections were jam-packed and they took turns chanting at each other from their respective baseline seats. And the game lived up to the hype. Led by Cuff and Carson Bottema, the Flyers ruled the first half. 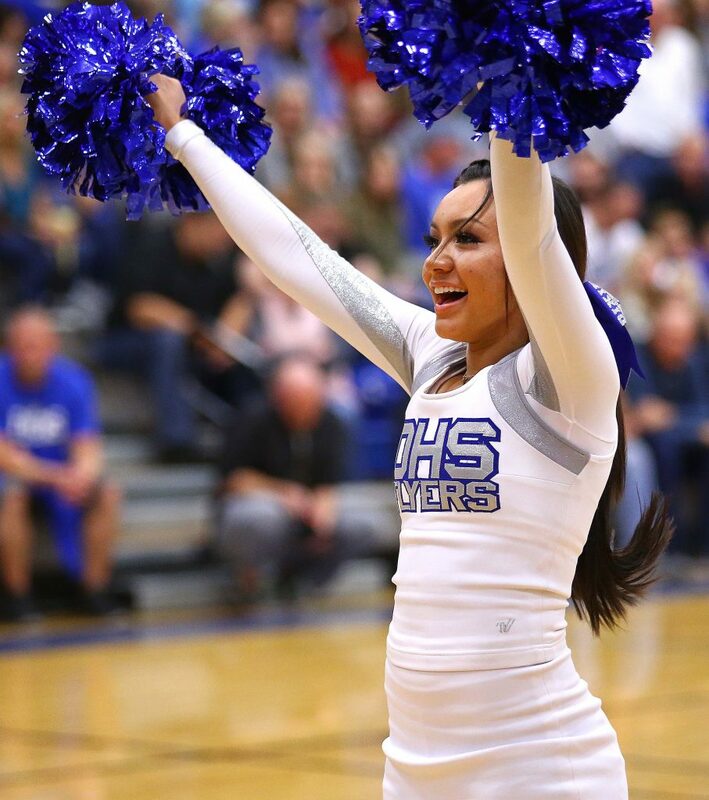 Dixie was up by nine after a trey by Bottema and a reverse layup by the senior with under a minute to play in the half. Tyler Marz hit two free throws with one second to go in the half to make it 26-19 at intermission. But the Thunder, the defending region champs, rallied immediately after the break. 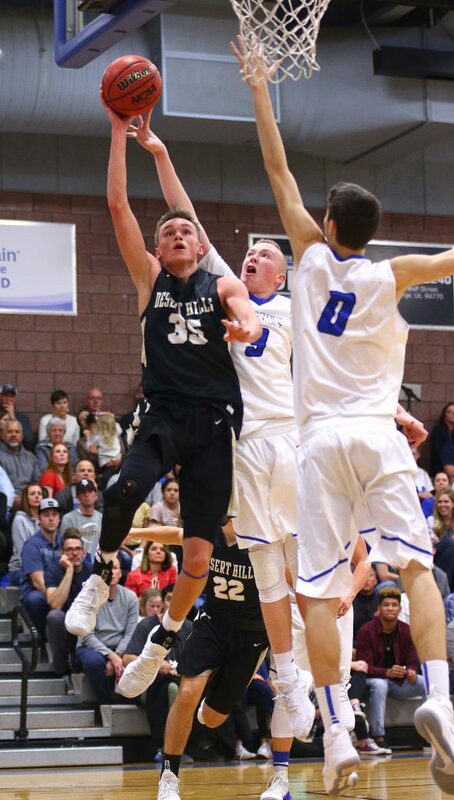 With 5:05 to go in the third, it was a 28-26 game after a scooping layup by Tyler Webber for D-Hills. The Thunder got their first lead since the opening basket of the game early in the fourth quarter. Tyler Webber hit a trey and Tucker Peterson scored inside to make it 38-36 with 6:18 left in the game. 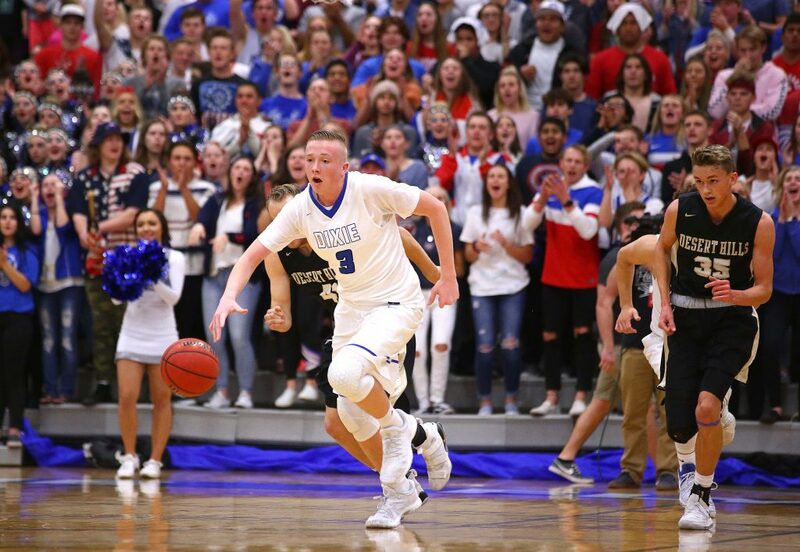 Cuff scored six quick points on a three-point play and a 3-pointer with under three minutes left to put Dixie ahead 50-46, but the Thunder tied it on consecutive steals and layups by Peterson and Trey Allred, the latter coming with 1:23 on the clock. 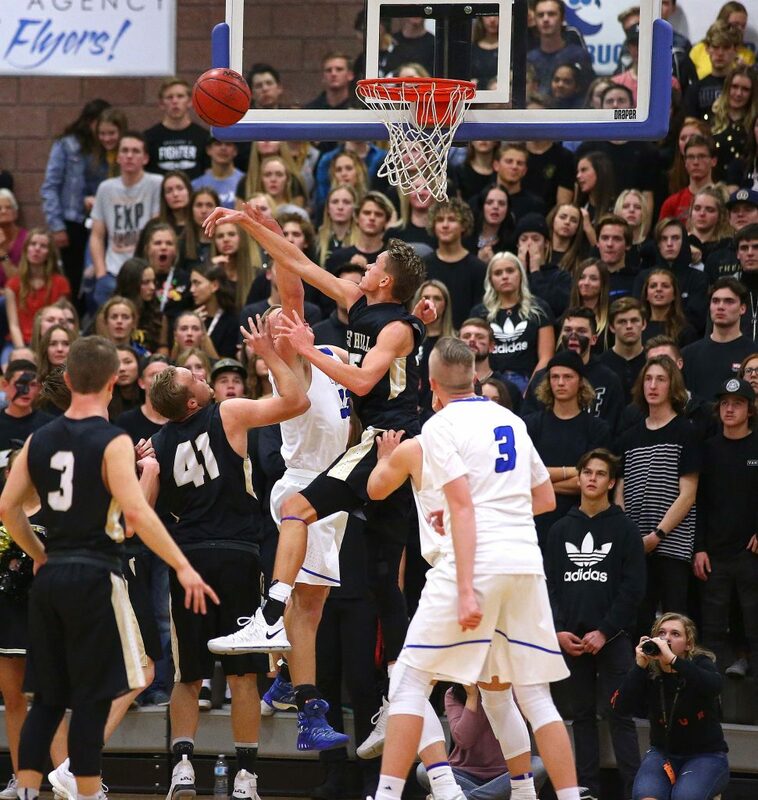 Wilgar hit two free throws with 1:18 to go to make it 52-50, and the Thunder tied it again with 49.5 seconds left when Peterson banked a straight-on jump shot. Dixie then worked the weave on offense to chew up the final 49 seconds before Wilgar’s last-second heroics. Not lost on Coach Cuff or his team was the free throw shooting in the game. 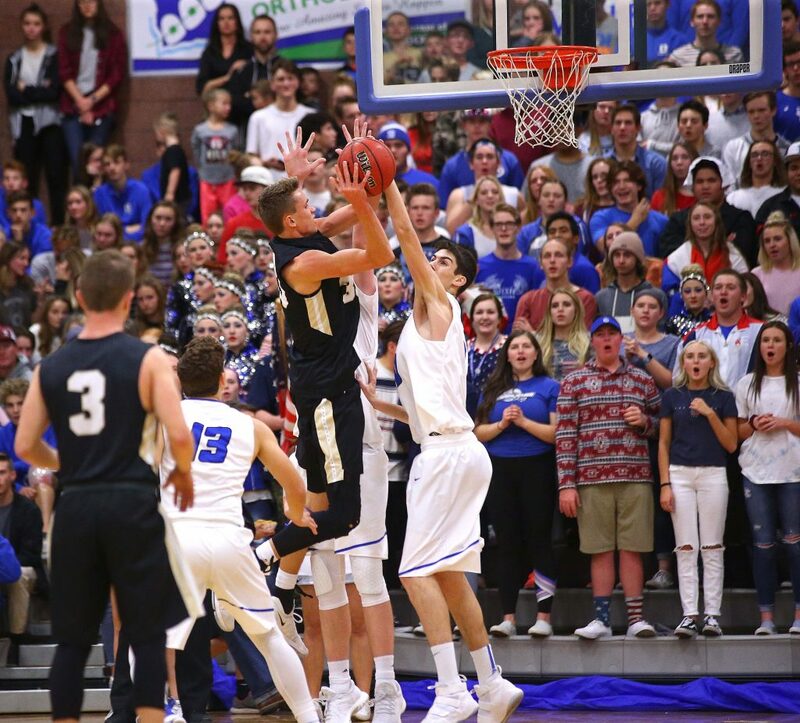 The Flyers made just 13 of 27 in an ugly win against Snow Canyon Wednesday. 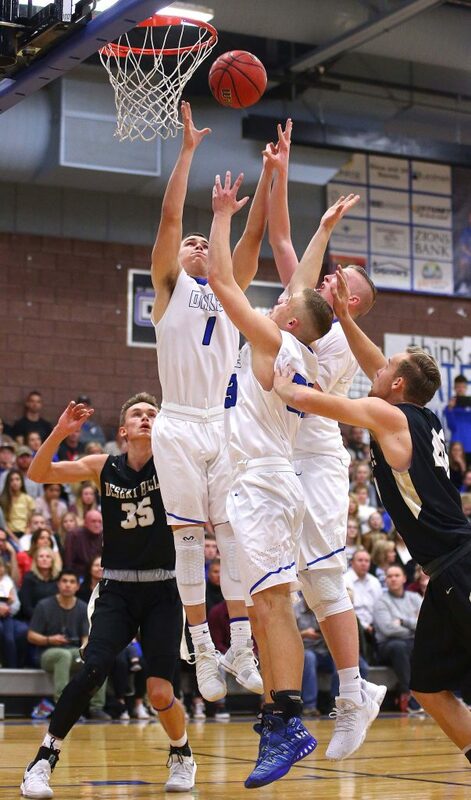 But on Friday, Dixie needed every one of its excellent 15 for 19 shots from the line (78.9 percent). Wilgar finished with 12 points and a team-record tying 13 rebounds (in the Coach Cuff era). He also made all six of his free throw attempts. 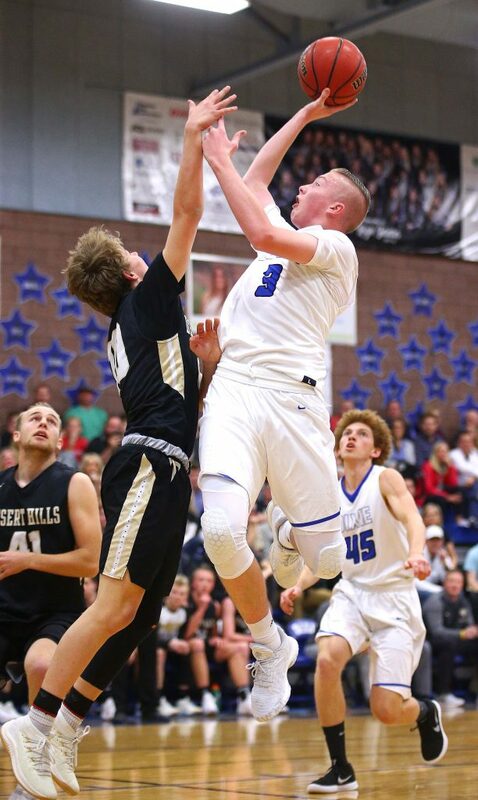 Tanner Cuff had a game-high 19 points, a big answer to a quiet four points Wednesday against Snow Canyon. 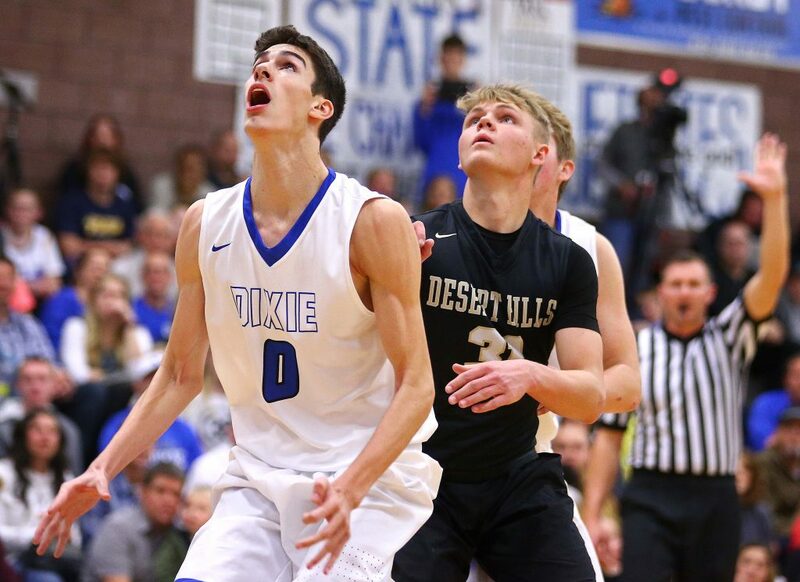 Bottema finished with nine points for Dixie, but was held scoreless in the second half. 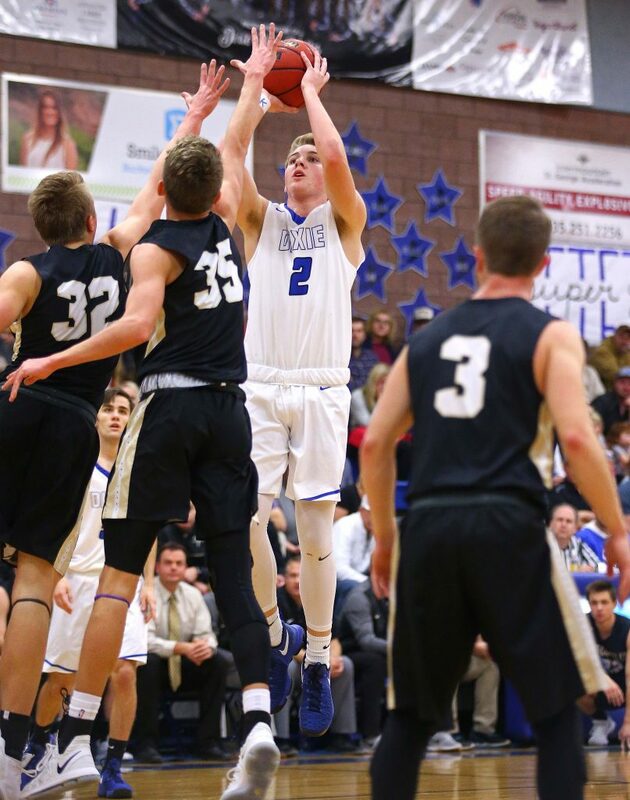 The Flyers made just three 3-pointers in the game, two by Tanner Cuff. 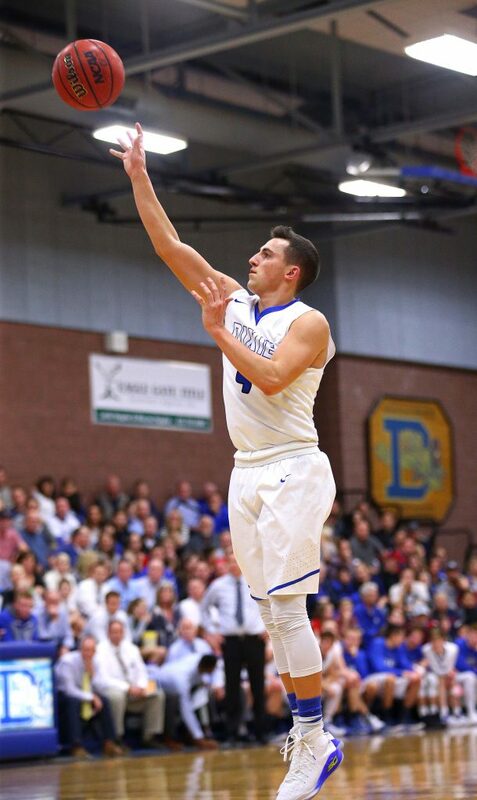 Dixie improves to 13-3 overall and is in first all alone with a 5-0 Region 9 record. 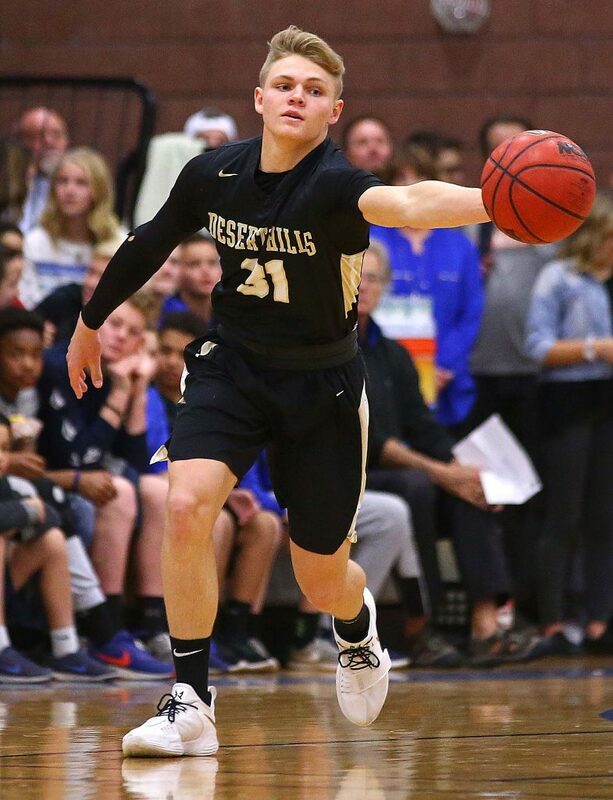 Desert Hills, 11-4 and 4-1, got 15 points from Peterson and 11 from Ryan Marz. Marz also had six rebounds and two steals. 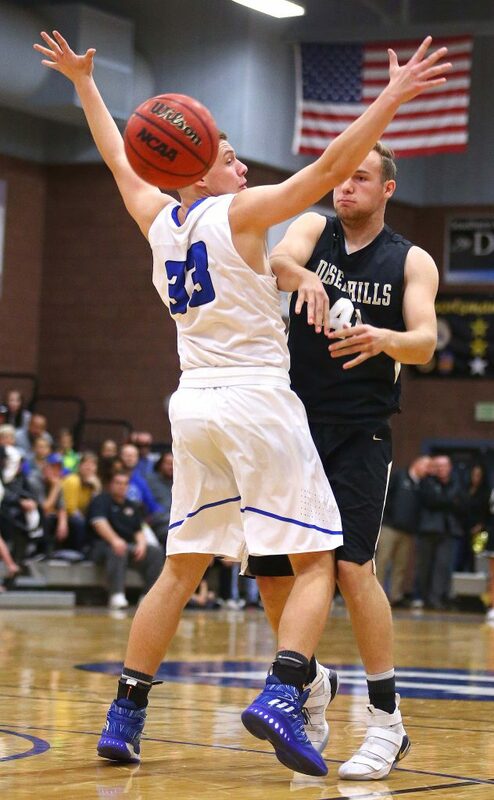 Dixie made 18 of 43 shots (41 percent) and owned a 28-17 rebounding advantage. 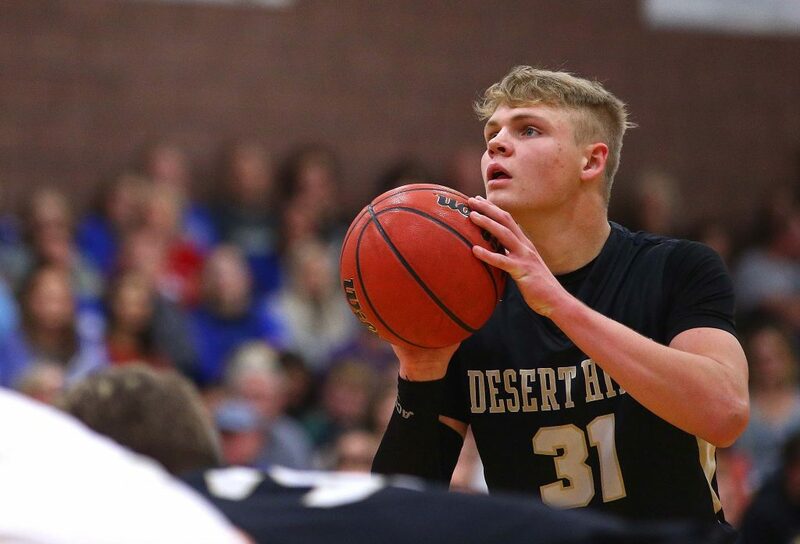 Desert Hills was 20 for 41 from the floor (48 percent), but made just 2 for 13 from beyond the arc. 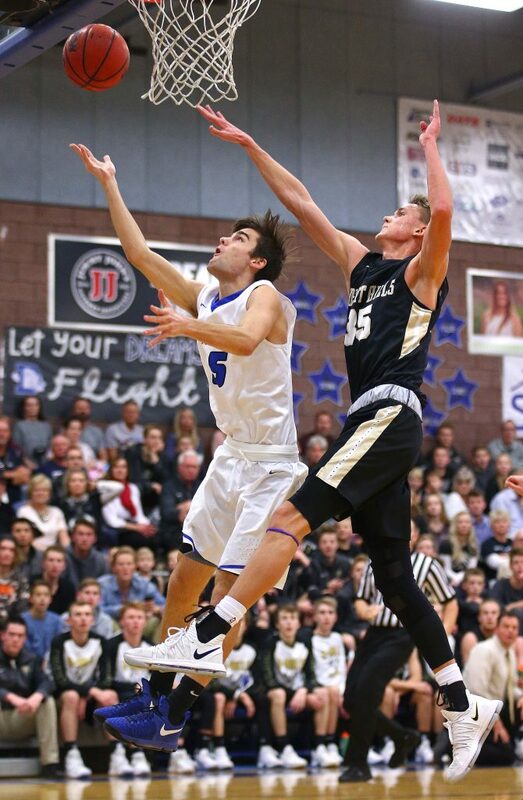 The Flyers are at Cedar next Wednesday, while the Thunder finish the first half of region play with a home game against Canyon View. A cold fourth quarter for the Tigers made this one look closer than it actually was. Hurricane led by as many as 19 early in the fourth quarter before a late flourish by the Redmen got them within eight at the final buzzer. 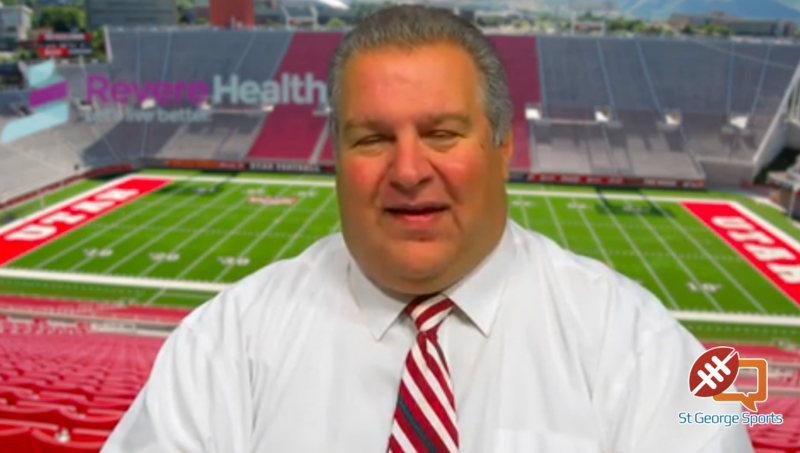 The real story was the defense played by the Tigers in the second and third quarters. Hurricane allowed just one basket in the eight minute-long second period, then gave up just eight points in the third to forge an insurmountable lead of 39-22 heading into the final period. 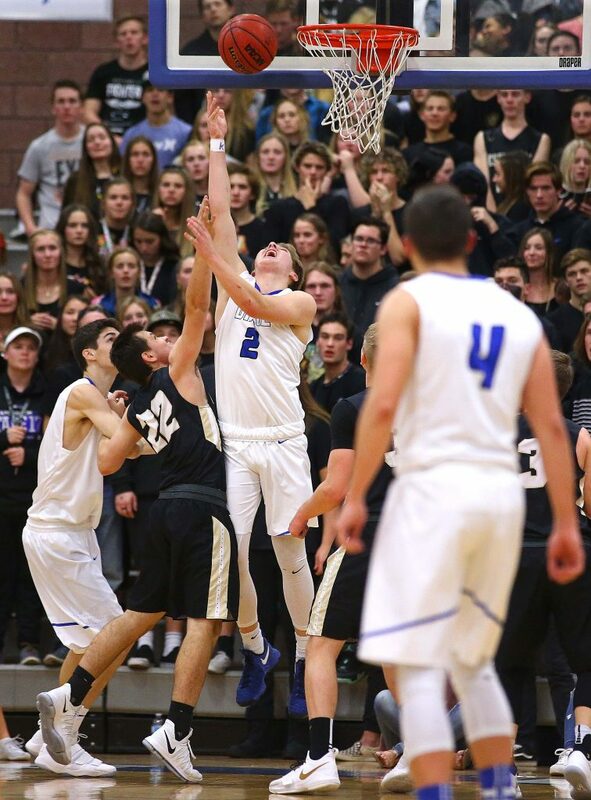 Last had 27 points and seven rebounds and continues to be one of the top scorers in the state. 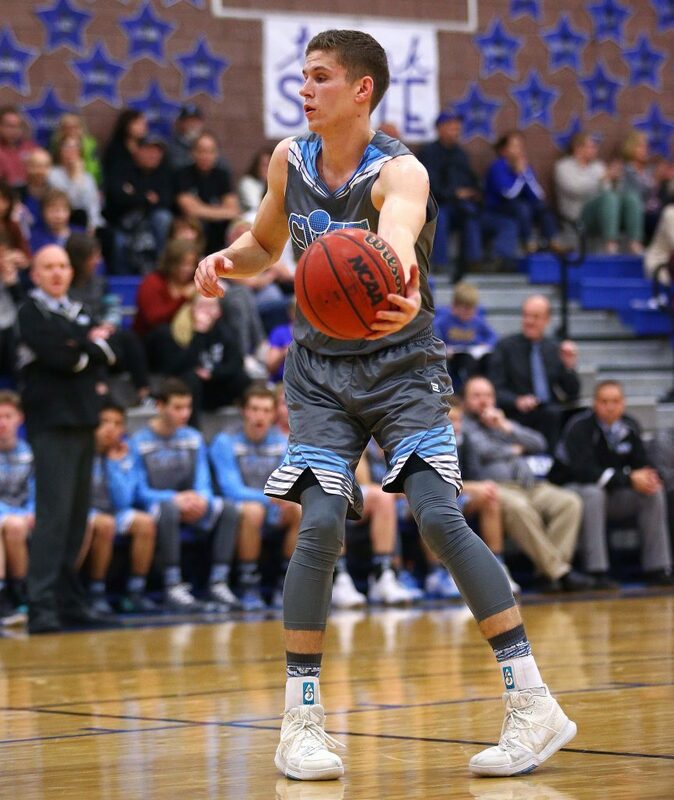 The senior guard made three 3-pointers and is averaging 25.8 points per game. Langston also praised the play of Russell Nield, who filled in for Reagan Marshall, who is playing through a painful torn labrum in his hip. 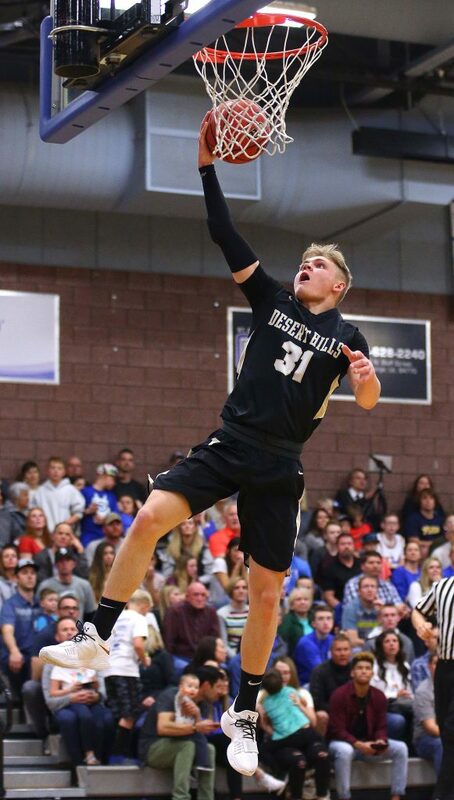 Matthew Meyers also played extended minutes and chipped in eight points for the Tigers, who improved to 9-5 overall and 3-2 in region play. Up 13-12 to start the second quarter, Hurricane got five quick points from Last on a layup and a 3-pointer. 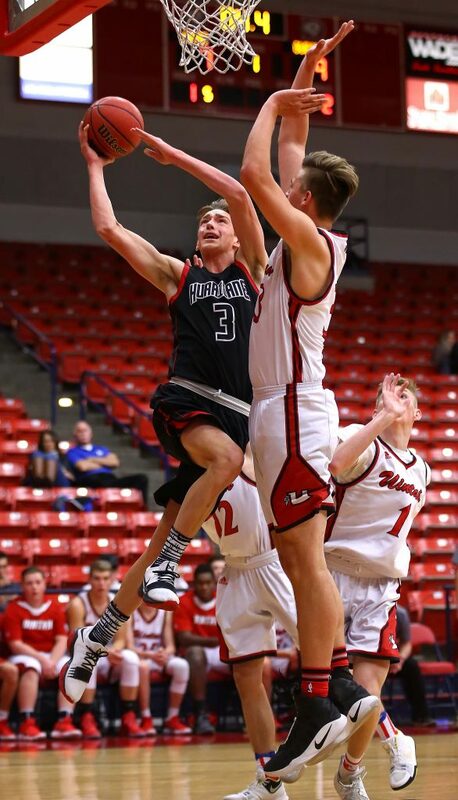 Cedar briefly cut it to 18-14 on a basket by Ryan Kite, but the Tigers would score the next seven points over the next five minutes to make it 25-14 at intermission. Hurricane then started the third quarter on a 5-1 run to make it 30-15 after a deuce by Last and a 3-pointer by Meyers. 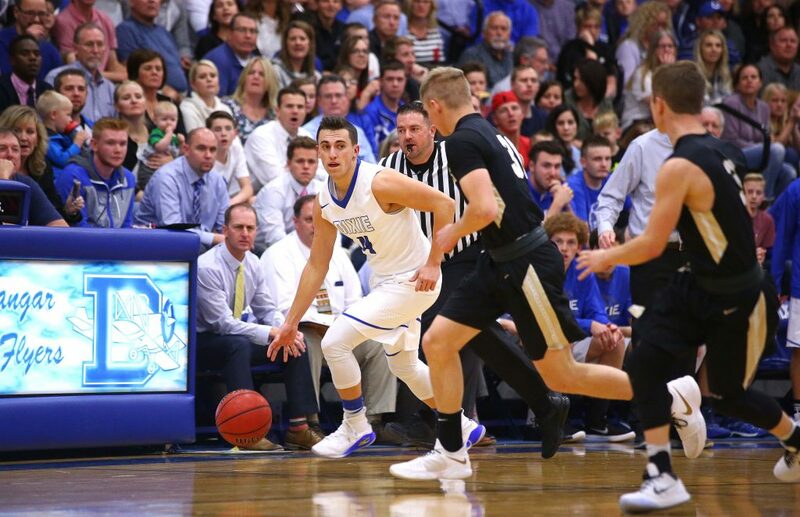 Marshall hit his only basket of the game to start the fourth quarter, but it significantly made it the biggest lead of the night at 41-22 and the Tigers cruised from there. Hurricane made 16 of 39 shots in the game (41 percent) and outrebounded Cedar 32-26. Cedar, 8-8 and 1-4, was led by senior Ethan Boettcher’s 18 points. Dallin Peterson added eight. 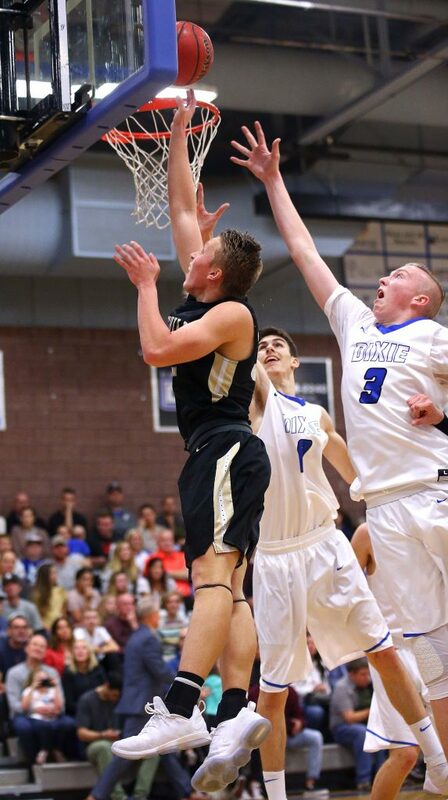 The Tigers play at Snow Canyon next Wednesday, while Cedar will host region-leader Dixie at Redmen Gymnasium. Senior star Brantzen Blackner had 19 points and junior guard Parker Holmes had a career-high 14 as the Falcons dominated after halftime to secure their second region win. The Panthers had 14 in the second quarter and that helped them stay within a point at halftime at 22-21. 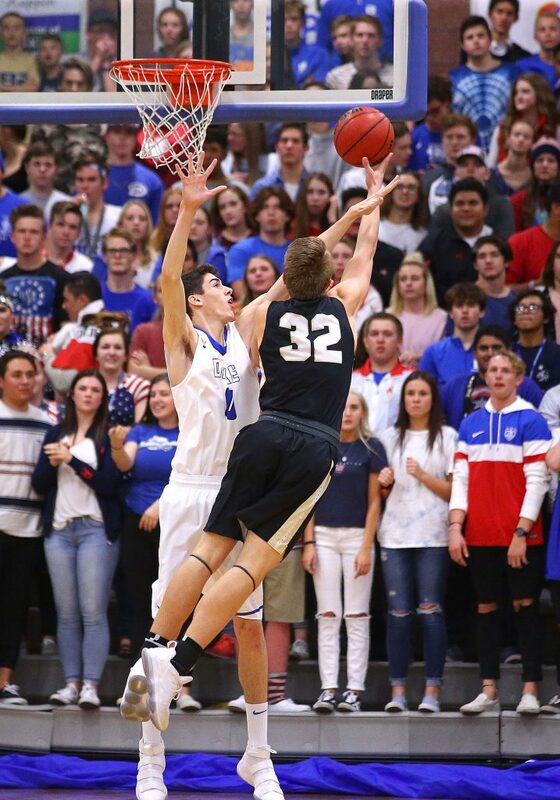 But the Falcons outscored Pine View 15-9 in the third and 15-9 in the fourth to pull away with the win. Potter said Holmes’ big night came via some good help from his teammates. The Falcons had nine steals in the game, and were also sharp at the free throw line. Canyon View made 17 of 21 charity shots for 81 percent. The Falcons, now 7-9 overall and 2-3 in region play, have won two straight. 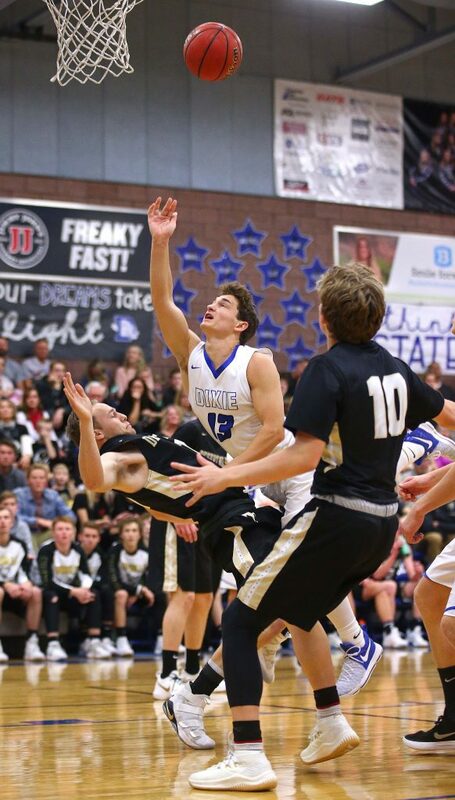 Canyon View was picked among the favorites in Region 9 heading into the season with a senior-laden team. 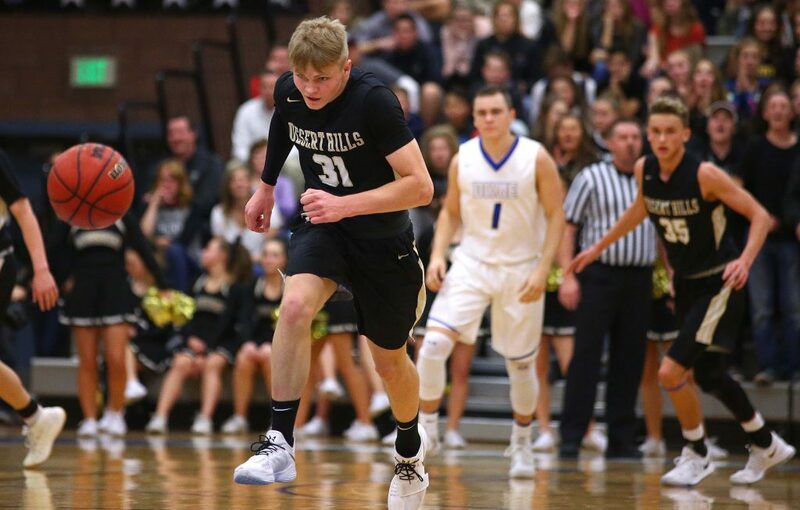 Canyon View plays the last game of the first half of the region schedule with a game at Desert Hills next Wednesday night. 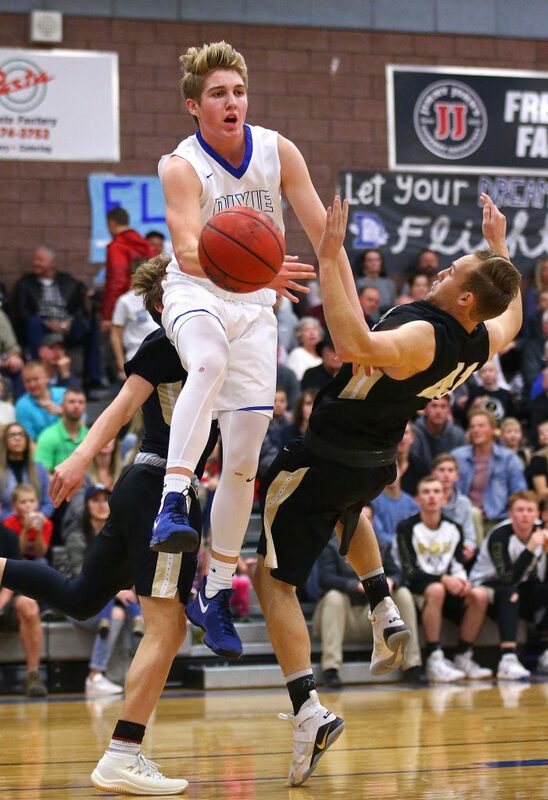 Pine View, playing without the ill Tayler Tobler, got 15 points from Hunter Moore. The Panthers’ other leading scorer, Jack O’Donnell, was held to eight points. 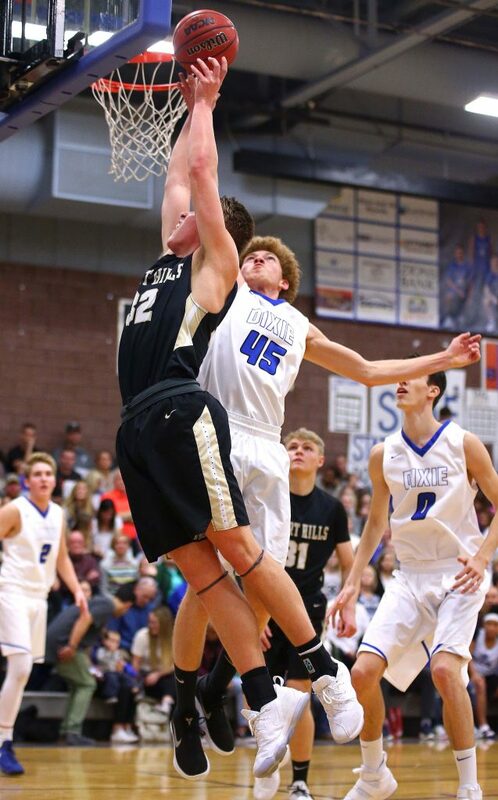 Pine View, 6-9 and 2-4, has a bye Wednesday and resumes region play next Friday with a home game against Snow Canyon.